Jim Vargovich is interviewed for the History channel’s new show Blood Money. A Montana fencing crew may not be the typical television reality show star, but leave it to Double J Fencing, of Victor, Montana, to think outside the box… or rather, wire. 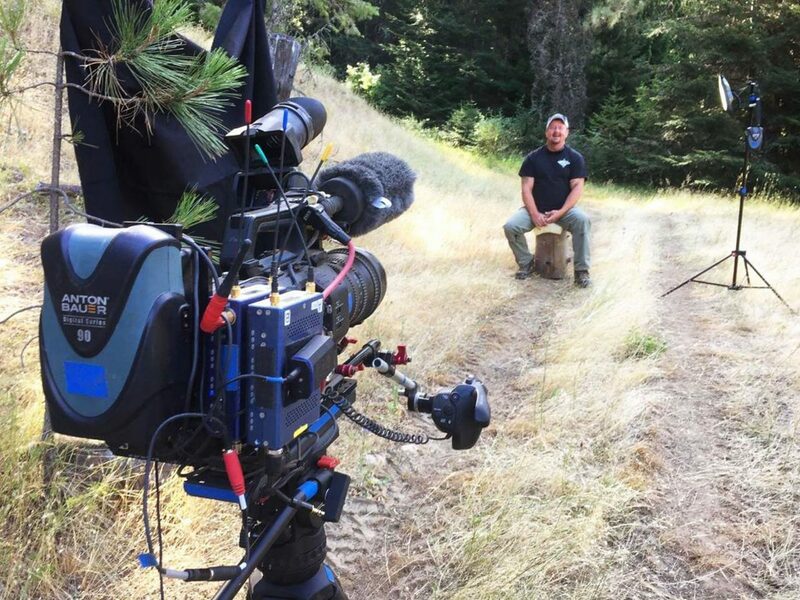 Jim Vargovich and his son Talon landed a spot on the History channel's new reality series Blood Money hosted by family estate planning expert Chris Parvin. Their episode, Fire on the Mountain, aired August 6 as the second in the series. The show features two different young men who are to complete a set task within a business, usually owned by their dad or family member. Rewards are given upon task completion. 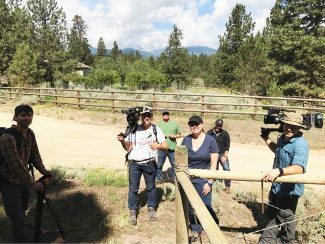 Talon, who was 15 years old at the time of shooting, agreed to install four miles of buffalo fence with minimal help in 9 days. His dad would then give him tuition for his college education. He plans to attend Montana State University in Bozeman after his final year of high school to pursue a degree in ag business. "He is a very humble kid. The most humble 16-year-old boy I've met," Jim said of his son. "On the day he was born, I prayed to God to make my son like my wife not like me." Jim started his life with the bare minimum, growing up in foster homes before joining the army at age 19 then attending college where he earned two degrees and building a fencing business that will gross two million dollars this year. Jim hopes to replicate the drive he received from his life experiences for his son. "Talon is a very soft-hearted kind man. He never wants to disappoint," Jim said. "I tried to get him to be prepared for anything." Jim and Talon landed their time in the light after a message pinged into Jim's email box from a production company from Hollywood. He consulted a "lifelong friend and fellow military man" Scott Shin, who is more of a glass half-empty type, whereas Jim is more of a half-full guy. "He's more of a hey, you better confirm and don't trust, and I'm more of a delusional optimist," Jim said. "But there was a number on the email, and I called and we did a Skype, the first time ever I did one of those, and the next thing I know, I have all these people out here with cameras." 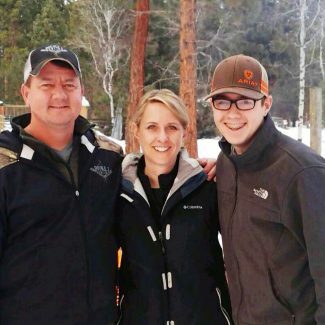 Their half of the show—they share it with 18-year-old Trevor Ritcheson of Keller, Texas, who had to brew, can, deliver, and pass a taste-test of craft beer in order to receive $200,000 from his dad Craig to start his own beer-distributing business—was shot for a month about a year ago. Jim watched the episode with the rest of America when it aired on History, but Talon decided to go riding instead of tuning in. He has since watched the episode, but doesn't care for his show of emotion. "He just doesn't want his emotion to be televised," Jim said. "When you're that hungry, hot, exhausted, and your legs feel like rubber from running pipe up and down the mountains all day long, it's easy to get emotional. He's a pretty young fellow to be given that responsibility. When I was a young man, I was emotional too. You break over those barriers and some of the demons within you as you mature. It's part of a learning curve and to be that exposed and that raw for a world-wide audience to see you, it sparked more emotion than normal." Jim warded off more than 50 calls while he was watching the show before finally turning off his phone, but he didn't get a single word of negativity. Among the complements he has received, he has also found opportunities to be a better dad to Talon and boss to his crew. "I got the opportunity to look from the outside as an audience viewer of the TV series. I had no idea there was that much expression in my voice or physical communication," he said. "I looked pretty animated for sure. There are so many things that came to light where I know I need to soften up a little bit." A dramatic moment in the show that was far from staged, Jim and Double J Fencing's Iron Words Manager Levi Brown both said, was a grass fire that broke out while welding braces. "The show was holding us up; we were like a month behind," Brown said. "We wouldn't typically be welding that time of year. I was definitely pretty nervous before that." What wasn't shown on the episode was that the crew had two 250-gallon water tanks full at the ready, and, as a precaution, they soaked the ground before welding and put down large wool blankets that were soaked overnight before welding. "It was a really small part of the show, but we had all of our equipment up there. It was the only reason we got fire put out," Brown said. "I had been telling them for a month, we need to hurry up and get there. It was getting too dry." The fire burned only three acres of primarily cheatgrass, before being shut down before it could reach the valuable timber that it threatened. "That timber the fire was racing toward was funding the project we were doing," Jim said. "The client's livelihood depends on that timber. We now have a new method where we don't have to weld in the field. We have specialized couplings for attaching brace panels and angle braces through Red Brand." Jim said that he was driving back from a meeting in Missoula when he heard word of the fire. "My toes went numb," he said. "That's never happened before." While I won't divulge if Talon completed his set task, he has definitive plans for his future regardless. The herd of registered Black Angus at the 17,000-acre J Seven Ranch southwest of Pocatello, Idaho, belonging to Talon's mother Loni's parents, Greg and Kathy Barkdull, has called his name from a young age. It was homesteaded by his great-great grandfather Eugene. "It's very important to Talon; there was something bred into him knowing he had to keep the ranch in the family," Jim said. "There is nobody left behind to carry on the J Seven brand. Talon just felt the need to do it. By God, he wasn't going to let it slip away." Whatever Talon has done, he has put forth the effort to be successful, from a young beginning in 4-H, and undoubtedly, he will do the same once he arrives at his grandparents' ranch. "Even when he was doing 4-H, before he was even old enough to show, two years in advance, he learned how to walk pigs and cows," Jim said. "It's the same at the ranch; he'll work his way up. There's no 'I'm the boss.' He would never want that anyway. He'll want to earn his way." As an Army-veteran, Jim is instilling a love of God and patriotism he feels is being lost in the younger generations of the family. "I believe every father who has a son should express to their son daily God, country, family comes first, everything else is second," he said. "It's getting lost in this nation." For those who watched the show and may have noticed slack in the new fence, Jim said that the fences were tightened after they could get back in in the spring to weld the braces then tighten wire, and Talon's work sufficiently kept in the bison. Blood Money may be watched on demand on the History channel's website or in the app.